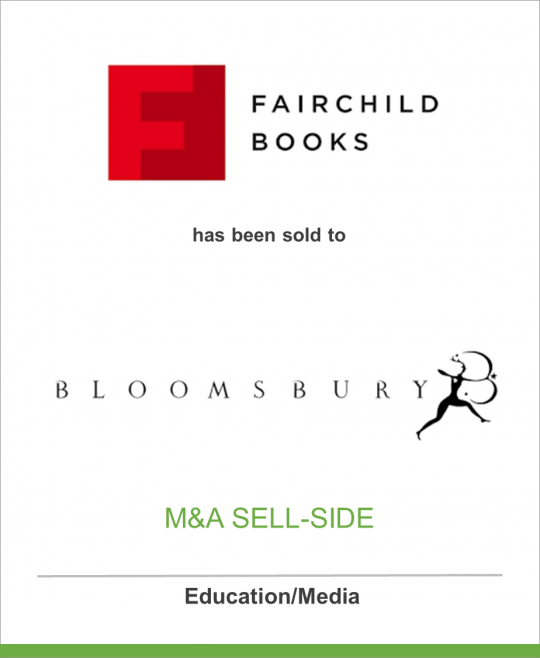 Bloomsbury Publishing Plc (“Bloomsbury”) announces that it has today completed the purchase of Fairchild Books. Fairchild Books, based in New York, is the market-leading publisher of textbooks and educational resources for students of fashion, merchandising, retailing and interior design. It has a revered history dating back to the nineteenth century and a world-class reputation for producing the very best student materials for the growing fashion and design industries. The Fairchild list is highly complementary to Bloomsbury’s existing academic list in the Visual Arts, which was bolstered by the acquisition of Berg Publishers in 2008, the launch of the award-winning Berg Fashion Library www.bergfashionlibrary.com in 2010 and the acquisition of a fashion photography archive in 2011 with in excess of 600,000 images. Through its Berg imprint, Bloomsbury has been ex-North American distributor for Fairchild Books since 2006. Growth has been particularly strong in the Indian market, where Bloomsbury has recently announced it is setting up a new subsidiary company. With this acquisition, Bloomsbury will significantly expand its US presence and raise its profile through an association with a leading brand in a market niche where it is already well established. Fairchild’s renown as a textbook publisher will create synergies with complementary products published under the Berg imprint that are aimed at more advanced students and researchers, but are sold to the same institutions. The combined business provides significant opportunities for new digital initiatives. Fairchild Books will be headed by Kathryn Earle and reporting into Bloomsbury’s Academic & Professional division, with Jonathan Glasspool as Managing Director. “The acquisition of Fairchild Books is part of Bloomsbury’s long term strategy to increase its Academic Publishing turnover in the USA, the largest market for English language textbooks. There is a perfect alignment between Fairchild’s list and Bloomsbury’s visual arts lists. Bloomsbury Information – includes a number of information databases for electronic as well as print publications. Publications include The Encarta World English Dictionary, The English Language Teaching Database, The Macmillan English Dictionary, Business: The Ultimate Resource, and others. Bloomsbury also provides management services for Bloomsbury Qatar Foundation Publishing, a division of the Qatar Foundation. Bloomsbury Adult Publishing – a substantial list of successful authors including Khaled Hosseini, William Boyd, Margaret Atwood, Donna Tartt, Elizabeth Gilbert, Richard Ford, David Guterson, John Irving, Jay McInerney, Ben Schott, Anthony Bourdain, William Dalrymple, Ben Macintyre, Dava Sobel, Mark Kurlansky, Chelsea Handler, Heston Blumenthal, Hugh Fearnley-Whittingstall and recent Man Booker Prize winner Howard Jacobson. The trade division also features significant reference projects including Wisden, Who’s Who, Reed’s Nautical and Whitaker’s. Bloomsbury Children’s Publishing – a highly successful list including authors such as J.K.Rowling, Neil Gaiman, Debi Gliori, Alyxandra Harvey, Carrie Jones, Shannon Hale, Louis Sachar and Benjamin Zephaniah. Fairchild Books – Fairchild Books is the world’s leading publisher of textbooks and educational resources for students, professionals and aficionados of fashion, merchandising, retail and interior design. Fairchild Books has a unique understanding of the fashion and design worlds. For over 60 years, Fairchild Books has published many of the preeminent titles in the fields of fashion and interior design. The vast majority of Fairchild’s titles are published in the classic college publishing model in which texts are adopted by professors or their departments to be used for specific courses.